If your browser looks like this one below, you really need to get rid of all that junk, and learn how to avoid them in the future. What are those toolbars and how did you get them? When you start installation of any program, you should carefully inspect any window that ask for your input, and watch for checkboxes with additional options. If you just click Next, Finish, it will probably install some junk programs that will make some damage to your system. Always choose Advanced options, because there are probably options for installing toolbars and other junk, hidden from main program installation. 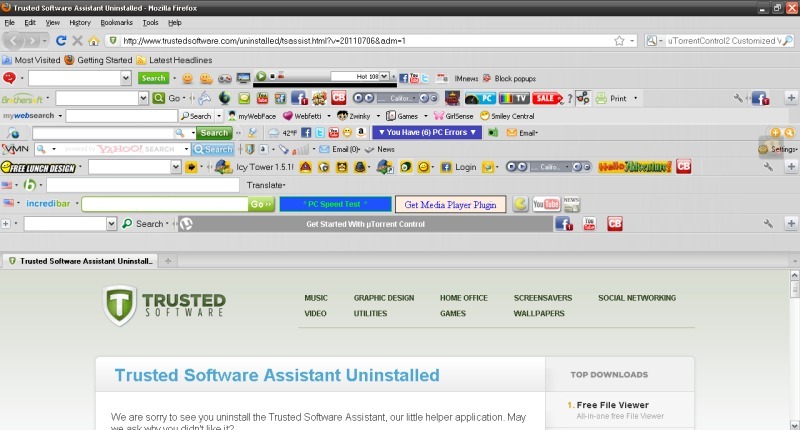 Toolbars are one of the most used addons to other programs, and probably the most annoying. How to remove toolbars from Firefox, Internet Explorer or Chrome? In Firefox find Tools, Addons, Extensions, and click Disable on the right side of any addon not needed. If you don’t know which of them are usefull, just disable them all, and later if you can not open something, find it here and enable. But you should leave enabled at least Java and Flash addon. The similar is for all other browsers. Just find Options or Preferences, addons and remove them. After that, you should restart Firefox / Internet Explorer or Chrome for changes to take effect. Change search engine in browser. Update: Install free AdBlock plus! We recommend installing a free addon for most browsers (Chrome, Firefox, Internet Explorer) called AdBlock Plus! This little tool will block 99% of annoying ads and pages, it is free and without any side effects. So, go to the product’s web page https://adblockplus.org/ and install it for free. And remember to support it if you like it, by little donation or just click on some ad.